Iris Cottage01263 715779work01603 870304fax Self-cateringA charming, cosy character cottage, well equipped with all modern amenities in a good location for exploring North West rural Norfolk, visiting Sandringham, local RSPB reserves and the beautiful beaches of the North Norfolk coast. Other: Towels, Tea towels, Books, Games, Beach toys. Notes: Pets not allowed, but owner's dogs visit occasionally. Due to the age of this character cottage, there are very steep, winding, narrow stairs to the first floor, as well as varying floor levels and some steps between rooms, which might make it unsuitable for those with mobility issues. There are also steps within the garden area.Brackets available for bike storage at guests liability solely. 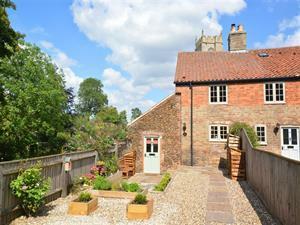 A charming, cosy character cottage, well equipped with all modern amenities in a good location for exploring North West rural Norfolk, visiting Sandringham, local RSPB reserves and the beautiful beaches of the North Norfolk coast.